TUI UK and Ireland, the charity's long-standing corporate supporter, have released a choir single with all proceeds to come to the charity. The cover of Louis Armstrong’s ‘When You’re Smiling’ released today through The Workplace Choir Company is available to download from Google Play for 99p. 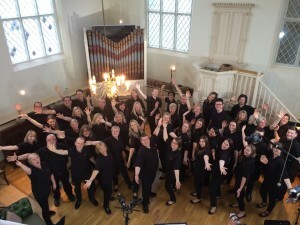 The TUI Choir was set up by The Workplace Choir Company in 2014 as part of its employee engagement strategy – leading to a hugely successful rehearsal programme, involving around 40 employees. Ahead of the launch of ‘When You’re Smiling’, TUI UK & Ireland’s Head of Engagement and Internal Communications, Lydia Hatley, said: “The choir has been the most amazing success – it’s a highlight in the many things we do to engage colleagues and make this a great place to work. The time rehearsing, performing and recording the single has really bonded a group of colleagues who may never have encountered one another in their daily jobs; they’ve not only made friends but connections we’re benefitting from as a business too. That sentiment was echoed by Andy Guthrie, co-founder of The Workplace Choir Company, who added: “It has been a delight to work with such an enthusiastic and dedicated bunch of people. The effort the choir has put into rehearsing and learning the music has paid off in so many ways. Last year TUI raised more than £500,000 for The Family Holiday Association through a number of projects including the launch of charity single ‘People Need Love’ by singer and TV personality Alesha Dixon, collecting change on flights and cruises, and donating money from the sale of scratch cards. The Family Holiday Association would like to thank the TUI Choir for producing a song with all proceeds going to the charity, and to the company for their continued support. 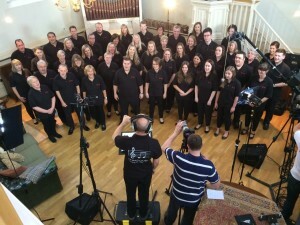 Download TUI Choir’s ‘When You’re Smiling’ here.